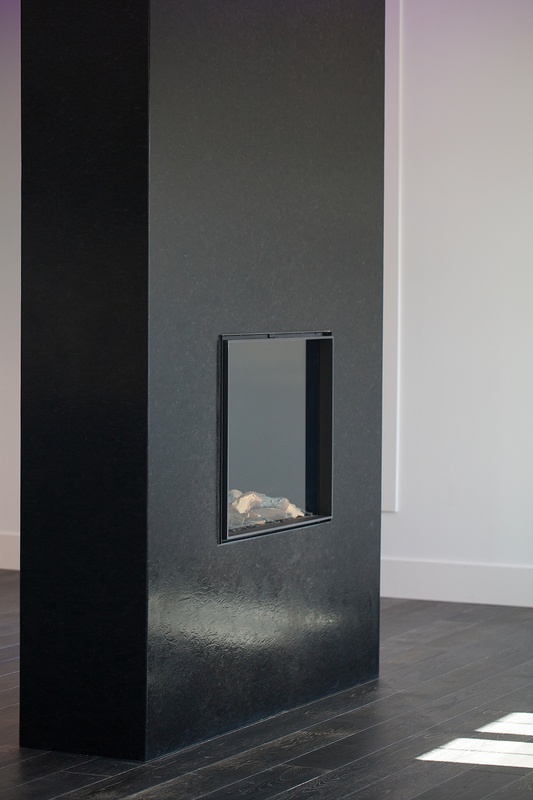 This seamless modern fireplace was fabricated with 1 cm thin slabs of antiqued Saint Henry granite from Polycor through Cosentino. Design by Jessica Boily. Fabrication by Mountain Granite. Photo by Annie Roy. When you're in the market for a thin surface, be it a countertop or a full wall backsplash, you've got more options today than ever. Porcelain, quartz and natural stone all come in ultra-thin tiles and slabs now, with a variety of color, pattern and texture. There is a demand from architects and designers for ultra thin materials that can give a seamless appearance while saving on weight. The fall 2016 issue of StoneWorld devoted several articles to installations featuring ceramic, porcelain and natural stone tiles and slabs. In one case ultra-thin flooring material was used to create an even transition between rooms. It's the same reason that architect Raphael de Cardenas' team chose large format 1 cm granite tiles for the Baccarat Crystal flagship store. 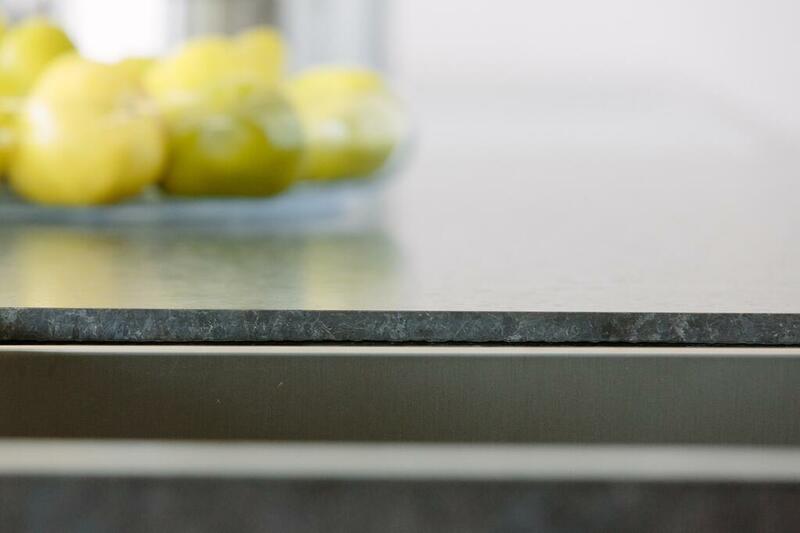 Kodiak granite countertop in 1 cm thickness pairs well with modern European cabinetry. 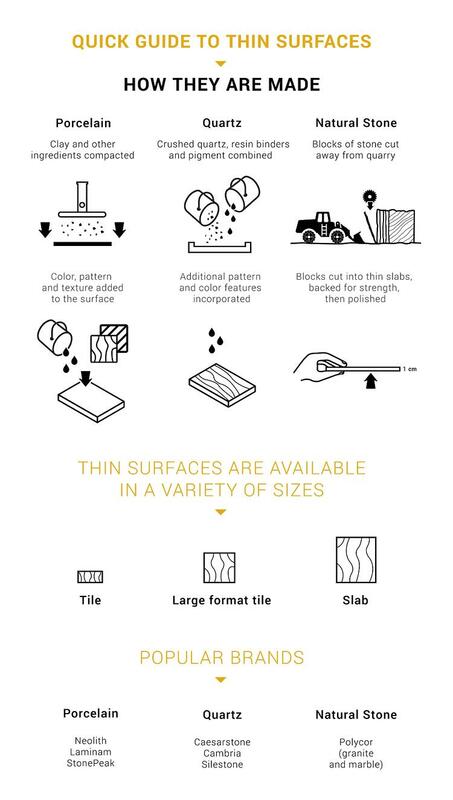 To help you understand some of the options available to you we've created an infographic to show you how thin surfaces are made and the popular brands to choose from. Surely there are even more brands than we've mentioned here, but we've included ones we see in the market most often. Polycor makes ultra-thin slabs, large format tiles and custom cut tiles in all of its marbles and granites. Want to see how designers are using thin stone? Download our 1 cm image gallery here.